We don’t do liquor so we always recommend Castles just off Camden Rd for traditional pie and mash. But, we do offer 21 award winning pies handmade in London and the home counties of which 3 are vegetarian and 5 are vegan/gluten free. There are 6 different Norfolk scotch egg recipes on the menu including a vegetarian option. There’s also creamy, horseradish and mustard mash and red wine, vegetarian or vegan/gluten free gravy to choose from, as well as various sides and seasonal salads and a kids menu for the little people. Sausage rolls handmade with Devon pork and scotch pies from Ayrshire made with prime scotch beef. All pies and scotch eggs can be purchased from the deli counter to cook at home. 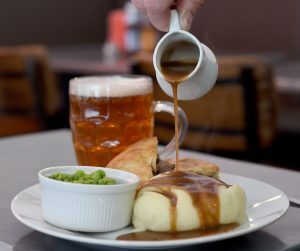 There are also daily Pie of the day £8.50 meal deals to takeaway. You can have a pie and a pint brought to you by Deliveroo or we can deliver a bulk order to your home or office at a mornings notice if your local. Lunchtime office deliveries can also be made through City Pantry and tables can be reserved through the OpenTable widget on our website. Draught beers from local breweries Camden Town Brewery, Hammerton Brewery and Beavertown Brewery are on weekly rotation, there’s 23 craft and traditional ales and ciders to choose from in cans and bottles. There is also a wide range of soft drinks if you’re off the booze and 8 tea flavours from the Brew Tea Company in Sunny Manchester. Dj’s spin 45’s every Friday night at The Eat to the Beat club and the entire restaurant can be hired for events on a Saturday night till midnight. And finally we’re now open Sundays 12 till 8pm from now on.